SINGAPORE (ICIS)--Some producers of polystyrene (PS) have maintained their firm offers this week amid gains in feedstock styrene monomer (SM) market. “We have rolled over offers for PS this week but hope to achieve higher spot prices,” said a producer in SE Asia. PS deals in the spot market remained under the level of the offers. Spot PS prices were hovering in the mid-$1,400/tonne CFR (cost & freight) China levels and around $1,500/tonne CFR SE (southeast) Asia. “We are trying to achieve higher prices this week as margins are becoming squeezed,” said a seller to China. PS resins are used for packaging, utensils, toys and consumer electronics. 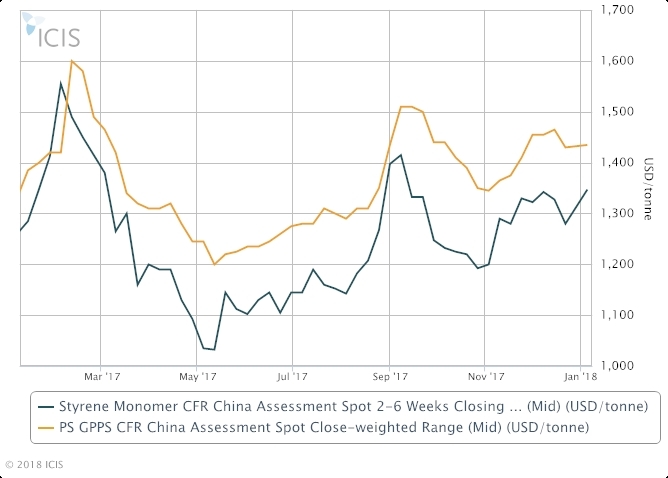 Meanwhile, prices of feedstock SM continued to gain ground this week to above $1,350/tonne CFR China, ICIS data showed. Traders expect some replenishing of PS stocks in the near term as end-users look to stock up some resins ahead of the Lunar New Year holidays in mid-February. The Lunar New Year, which is on 16 February 2018, is celebrated in most parts of northeast and southeast Asia. “Some buying interest may emerge in end-January but no significant and sustained pick-up in demand [is] expected,” said a Hong Kong-based trader.